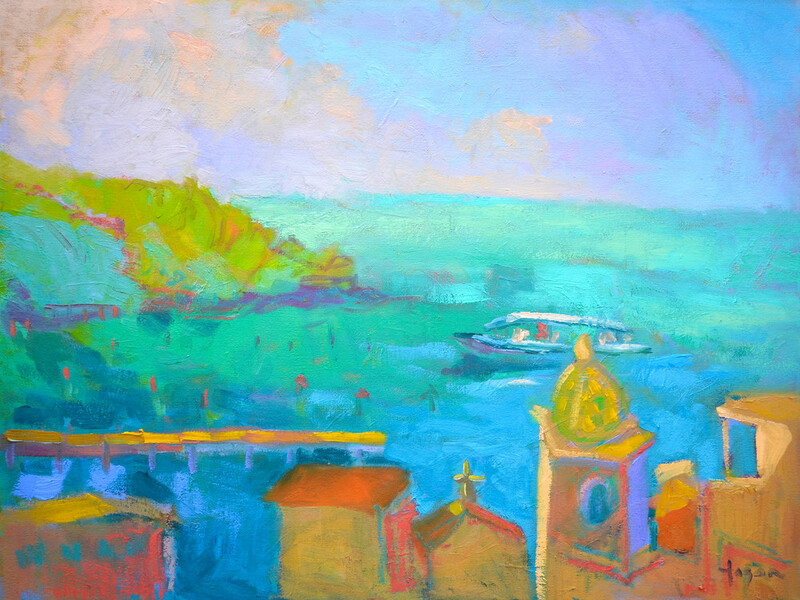 This fabulous view of Marina Grande is vibrant with Emerald Turquoise water, Coral rooftops, and a sunset sky. 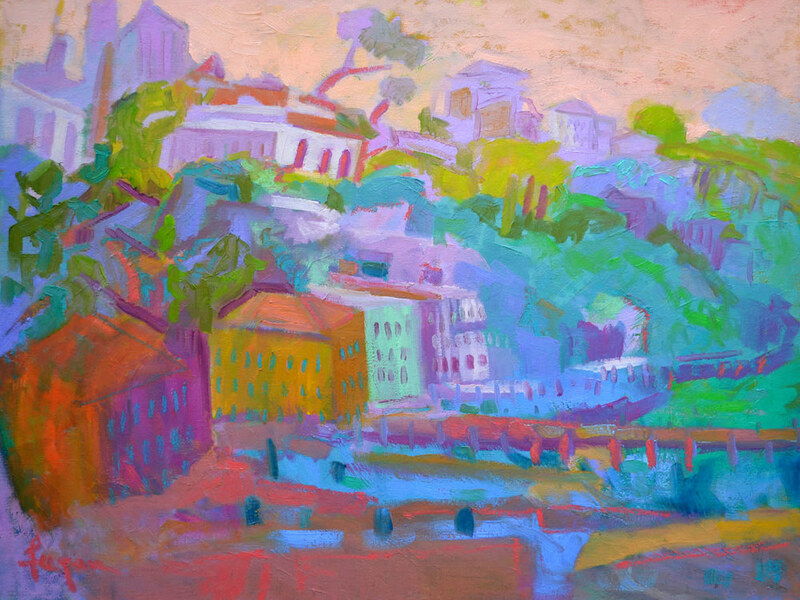 Interpretation Several passages challenge our imagination in this painting. The right panel focuses on earthly passage with the juxtaposition of the tour boat, a long dock, small cross on the church in the foreground, and the minaret. In contrast, the left panel takes the eye upward through a series of large structures, topping off at the sky with sunset colors. Each of these shapes and colors may contain different messages for each viewer. This painting was inspired by several small watercolors Dorothy painted on location at Marina Grande in Sorrento, Italy. Colors of the heart reflected in this painting include Violet Orchid, a particularly important healing color as it is a bridge color connecting the top of the rainbow spectrum with the bottom. Healing aspects of this color fuse spiritual awakening with the physical body. Whimsical interpretations of The Creator's messages in day to day life move all of us to love and compassion, joy and acceptance with every cherished moment. Blessings to you! Decor This painting would be wonderful over a master bed or mantle. Dorothy recommends hanging the unframed panels close together, within an inch or less. Marina Grande Sunset View, Almafi Coast, Italy. Dreamy Magical Villas Spilling into a Turquoise Sea. Contemporary Abstract Style, Joyful Colors. 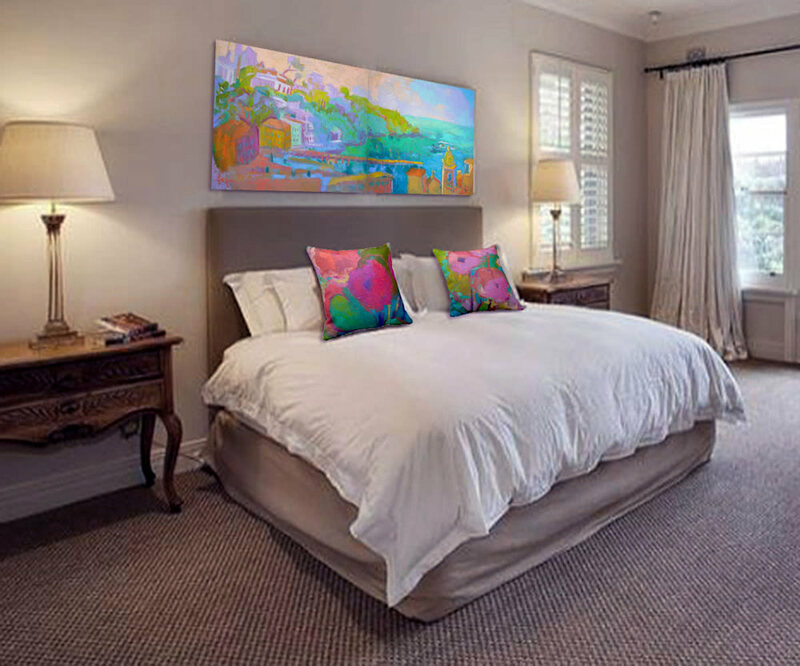 Paintings may be hung side by side, over a bed or mantle. The edge of this canvas diptych is toned with Dorothy's soft neutral Lavender Charcoal tone to match the colors of the painting. It may be framed if desired. Use the Wall Preview Tool to check the scale and color of your room. Fine Art Prints are created with highly-pigmented, archival inks, rated to stay vibrant and true for a hundred years, printed on archival cotton canvas. Double boxed for safe shipping. Dorothy Fagan Collection fine art canvas prints are coated with a satin finish, non-yellowing UV resistant varnish for protection, durability, and long life. For a contemporary, gallery look, your canvas print can be hung "Gallery Wrap" style on 1 1/2" deep stretchers.. 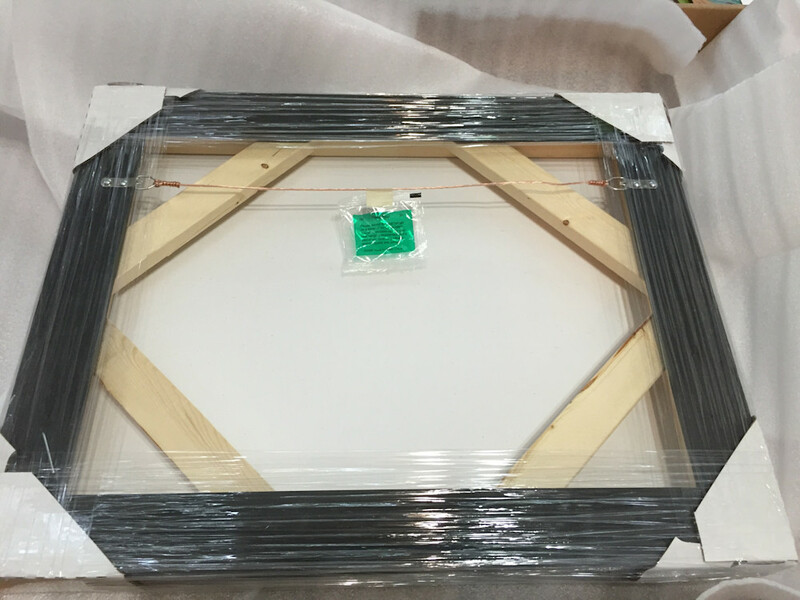 If you prefer to have your art framed, Dorothy recommends the 3/4" canvas stretcher so that the canvas will fit the depth of a wider variety of frames that your favorite framer may offer. 48" x 18" 64" x 24" 72" x 27" 80" x 40"
Pair with Passage I. To order diptych, order Passage I and Passage II in the same size on canvas with 1 1/2" deep stretchers. Paintings may be hung side by side, over a bed or mantle. We use only the finest Epson archival inks that stay rich and beautiful for over a hundred years. Our heavy-weight artist canvas provides an incredibly wide color gamut for deep rich blacks. And we varnish it with a satin finish, UV scratch-resistant varnish. Our canvas prints are available on 1 1/2" or 3/4" gallery wrap stretchers, framed or unframed. Your artwork will be printed to order and double boxed for safe delivery to your home. Please allow 3-5 business days for us to complete your art. We will send you an email when it is shipped.